World attention lately has been on a batch of crises; the Syria civil war, the flow of refugees into Europe and political shifts toward right-wing populism. But the dilemmas and challenges that have plagued Afghanistan linger particularly where the interaction between security and development reveal themselves. The situation will no doubt retake headlines at some point in the near future. As I write this in Kabul, I’m struck by the turbulence of the last 15 years and the scars it has left. The city itself is hard to recognize from my first visit in late 2001. New buildings line the streets and traffic clog the streets during the day. The population has swelled and for several years the country had the fastest economic growth rate on the planet. Most development indicators showed vast improvement. International aid was part of the reason. At its height, hundreds of billions of dollars flowed into the country. Some was for development and humanitarian aid and some of it went directly to political-military leaders (‘warlords’) to pay for ‘stabilization.’ This second part is widely seen as a huge error. The return on these investments, the ostensible outcomes sought, have been poor. Now, the economic bubble has burst. European and US aid has been slashed in half and the international presence that once made for a lively night out is dried up and gone (expat hangouts are shuttered and the glossy magazine “Afghan Scene” that chronicled it all is no more). At least there’s a sardonic humor that is evident of those who endure. Those who wished the foreign presence would ‘go away’ have gotten their wish. Security remains a key issue. Two years after the US-led mission in Afghanistan ended and the country continues to trudge along with a small international force to assist with training and targeted military operations. Even the government admit that it controls only 258 of 407 districts, while insurgents control 33 and 116 districts are contested. The Taliban and other anti-government elements remain ever present. In the last few days, the Taliban’s spokesman announced that they would no longer attack development projects and are “committed to protecting them.” Most local observers see this change about energy resources that cross the country into Pakistan and not as a change in ethos of the group. Targeted attacks designed to spread fear, the original reason for the US-led coalition 15 years ago, continue. The Islamic State (deash, ISIS or ISIL), has gained a toe-hold in some areas particularly close to Pakistan, although this is more of a ‘re-branding’ exercise of existing groups seeking to link themselves to the military successes in Iraq and Syria. The “Great Game” is used to describe the political and diplomatic confrontation that existed for most of the nineteenth century between Britain and Russia over Afghanistan. What has been happening can be seen as the “greatest of games” given the shifty nature of alliances, profiteering, extortion and payment for favors. Corruption is so rife that it stifles nearly every aspect of life. Not only are there strong linkages between crime, insurgency and enterprise (whether commercial, government and charity-related) but these relationships and back-channels cut across a diverse and tangled network including families and friendships. While the Western government, militaries and aid agencies have been complicit in creating this untenable situation, the local elites and powerholders have run with it. The impact has been that hard fought stability continues to be a veneer. Even the US’s Special Inspector General on Afghanistan Reconstruction, John Sopko, has admitted that “past gains are eroding.” This is no doubt an understatement. Certainly, those who suffer the most are the most vulnerable. 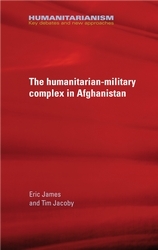 In “The humanitarian-military complex in Afghanistan”, Tim Jacoby and I examine how this situation has come to pass. We look at how the dynamics of security (particularly Western military forces) and the agencies involved in providing aid (particularly non-governmental organizations) evolved, grappled with the situation and with themselves. Based on extensive field research and in-depth analysis, we unpack issues of history, policy, ethics and effectiveness. A key issue is that aid agencies change their policies and actions depending on the context thus raising the possibility of transcending the simple “for” or “against” arguments leading to a more refined understanding of the relationship between humanitarians and the military. This complex set of issues is not just important for the organizations themselves but for the right local policy prescriptions and practices. It is often noted that without security, there can be no development. It is also necessary to know what has passed to have an effective path forward. The remaining concerns and shifting political dynamics – not just in Afghanistan but its neighbors, various regional powers as well as in the West – may set the country on another episode. …violent conflict brings together two seemingly disparate groups: humanitarians and soldiers. This mixes and convolutes agendas, blurring lines that are often perceived to be sacrosanct. Delving deeply into the history and reasons of why these two groups work in close proximity, this study provide a unique insight into the history, ethical dilemmas and policy conundrums when aid workers operate close to the military. Using Afghanistan as a case study, analytical rigour, deep primary research and “field” knowledge are combined in an exceptional contribution to this important area. This book gives scholars and practitioners alike a nuanced perspective on the challenges faced by aid workers, military personnel and decision-makers alike in countries affected by violent conflicts, hosting foreign military interventions and receiving international aid.